School meals are a powerful educational support: improving behavior, ability to focus and academic performance. School meals are also an important source of nutrition for all school-age children with school meals being more nutritious than what most children buy from outside sources or pack from home. Many low-income Vermont students rely on school meals as their most consistent source of quality food. Prevent hunger: School breakfast has been linked with fewer visits to the school nurse, especially in the morning. Provide balanced meals: School breakfast participants are more likely to consume diets that are adequate in important vitamins and minerals. Children who live in hungry households depend to a greater degree on school meals for their nutrition. Model balanced nutrition: Children who eat school meals have improved nutritional health. Expand children’s palettes: Introducing children to new healthy foods which they may not otherwise have the chance to try gives them the chance to develop preferences for a wider variety of foods. Combat childhood obesity: School breakfast participation is associated with lower body mass index, and less of chance of a child being overweight or obese. 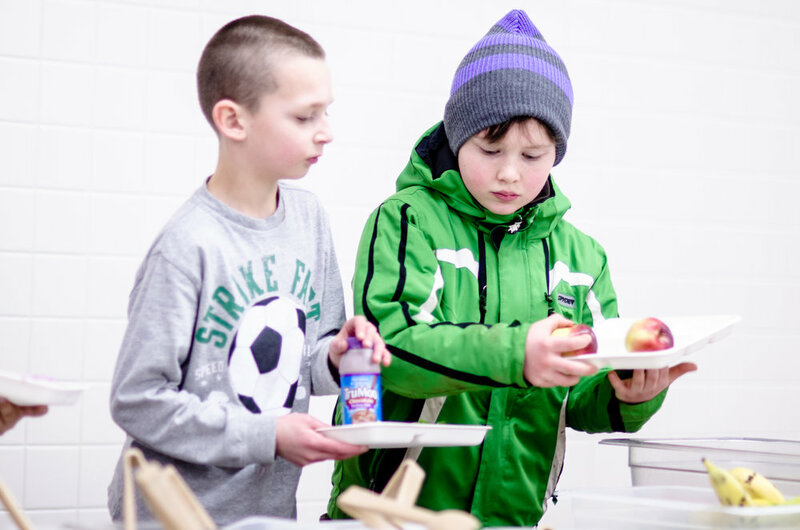 Alleviate Hunger: School meals help families stretch food budgets and prevents hunger at home. Help kids stay focused on the task at hand: School meals improve students’ ability to focus and reduce behavior problems. Reducing missed class time: Access to meals at school improves students' attendance and reduces tardiness.